Sometimes it’s better to pay more upfront and invest in quality, which can end up saving you money in the long run. 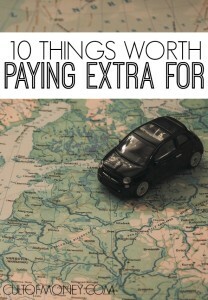 Here are ten things that are worth paying extra for. If you’re a homeowner with higher than average utility bills your appliances could be at fault. Old refrigerators are among the biggest money-sucking appliances, using three times the amount of electric as newer models. Older freezers and clothes dryers aren’t far behind. Next time one of your appliances breaks you may be better off paying extra for a newer model than searching Craigslist hoping to find something used and cheap. Just be sure to do your research before buying new appliances. Energy efficient appliances will list on their sales tag the average amount of electricity they’ll save you per year. Compare that savings to the overall cost of the appliance. There are some instances where it certainly makes sense to do your own taxes. DIY taxes are great for those with fairly simple tax returns and who feel confident in their abilities to act as their own tax preparers. Everyone does not fall into this boat. One service we found that was amazing at remedying this solution is TaxChat. They are in between what you’d pay DIY and what you’d pay an in-house tax prep company but you can do everything from your phone. Good health is something that’s hard to get back once it’s gone. Since we’re all different people with different bodies and different genetic make-ups it’s hard to peg a perfect list of things you should spend on for optimized health. Instead, spend in the areas that make you feel better. These are commonly high quality food, a gym membership, and good healthcare. When I was buying cheaper laptops I went through at least one per year. When one went bad I’d run out and buy another cheap laptop. It was vicious (and frustrating) cycle. I finally smartened up and spent twice as much as I normally did on a laptop and haven’t had problems since. This has definitely been one instance where spending more upfront has saved me money in the long run. I don’t know about you but quality service is something that’s extremely important to me and it seems to be harder and harder to find. I am willing to spend more money on quality service whether that be to the person who cuts my hair, a restaurant that I feel good about going in or an accountant I trust. Quality service is worth more money. This one comes with a catch. Vehicles are one of the fastest depreciating assets you can own. This makes buying a brand new vehicle a bad decision almost 100% of the time. On the opposite end of the spectrum if you go as cheap as possible you’re going to end up paying more in repairs than your car is worth. Look for a quality used car that has been well-taken care of. It’s worth it to spend a little more on a car that’s going to run for years to come and that won’t break the bank in maintenance and repair fees. Our best advice is to let your common sense guide you on this one. According to the Council for Better Sleep your mattress should be replaced about every seven years. Seeing as sleep is one of the most important aspects of health and something that we all have to do, it just makes sense to spend a little extra money on a good mattress. Another area where it pays to pay is clothing. Opt for quality clothing that will last for years. The good news is that you don’t have to break the bank buying quality clothing. You can find great clothing options used at consignment shops locally and online. Spending money on fun experiences with family or friends is money well-spent. At the end of your life all you’re going to have is your memories. You shouldn’t feel bad about occasionally splurging on fun activities with the people you care about. On the flipside it’s also easy to get out of control when it comes to spending on experiences. You should be safe if you plan fun outings and vacations rather than doing them all on a whim. Self-improvement is a life-long, ongoing goal. There are always new things to learn and various ways you can improve yourself. Investing in yourself, in whatever aspect you see fit, is one of the best investments you can make. In the end striking a balance between saving and spending is key.